Dominique Wilson is an Australian historical novelist. 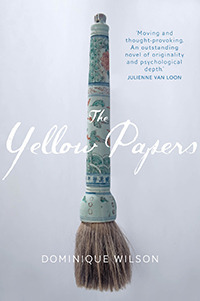 She here gives an in-depth account of how she researched her novel The Yellow Papers, and also offers advice to others on how to research historical novels set, or partly set, in Asia. The Yellow Papers is a novel set between Australia and China, from just after the two Opium Wars to the time of the Cultural Revolution. It is a story of love, obsession and friendship set against a backdrop of war and racial prejudice. It begins in 1872 when China – still bruised from its defeat in the two Opium Wars – sends a group of boys, including seven-year-old Chen Mu, to America to study and bring back the secrets of the West. But nine years on Chen Mu becomes a fugitive and flees to Umberumberka, a mining town in outback Australia. He eventually finds peace working for Matthew Dawson, a rich pastoralist. Years later, Edward visits a mysterious and decadent Shanghai, where he falls in love with Ming Li, the beautiful young wife of a Chinese businessman, until invading Japanese armies tear the couple apart. Many years pass before the couple reunite, each scarred by the events of World War II and the Korean War. But China is now in the grip of the Cultural Revolution, and Ming Li's grandson, Huang Ho, has joined the Red Guards. Will this new conflict, and Huang Ho's beliefs, tear this couple apart once again? Then one day I came across a copy of Boundless Learning: Foreign educated students of Modern China, a beautiful book published by the Hong Kong Museum of History to celebrate the last 150 years of China's foreign-educated. This text is complemented by an abundance of photographs of students, artefacts, academic records and letters written by those students, and amongst these is a sepia photograph of the very first group of Chinese Educational Commission students to be sent to the US in 1872. They ranged in age from approximately 7 years old to 12 or 13, and at the very end of the front row is the smallest of these boys. As soon as I saw the face of this little boy, I knew I had one of the characters for my story – visually at least, for at this stage I had no knowledge of these boys' experiences. Whilst the older boys stood heads up, looking straight at the camera, this small boy, with his chin tucked onto his chest, looked scared and worried - what must it have been like for him, to be sent across the world at that age? When I learned that not all of these boys had returned to China, and that nothing was known about some who did not return, I knew I had my first character – Chen Mu. I send away for this book, and any other I could find on what came to be known as China's First Hundred. It was during a casual conversation, a short while later, that I discovered that during the Cultural Revolution, many Chinese students studying overseas returned to China to join the Red Guards. The idea of a student returning to China to join the Cultural Revolution hinted at a reason why he may reject Western ideas, but this brought forth a problem – if Chen Mu was around 7 years old when chosen to go to America, he would have to have been born around 1865. If this new character was a student in the West at the start of the Cultural Revolution, he would have to be around 17 or 18 years old, and so born around 1949. Eighty-four years difference between the two – I would need to link them somehow. So I envisaged a third character – a Westerner this time – who would know Chen Mu, have reason to travel to China and somehow meet this character. Serendipity, in the form of a documentary, provided this link; full of actual film footage of Shanghai in the '20s and '30s, it examined the lives of Westerners in Shanghai at that time. I decided my Western character [Edward], would be an Australian who would go to Shanghai during the 1920s-30s on business, where he would begin an affair with the woman who would, in time, become the grandmother of my 'Cultural Revolution student', Huang Ho. From there a general plot began to take shape. My research can best be described as funnel-shaped – starting of very broadly and narrowing to specifics as I went along. I began by skimming over modern Chinese history, as well as Nationalism and Marxism, the place of women in Chinese Society, state control and national identity, and Chinese religious beliefs and traditions. I also read books and papers on the psychology of conflict and crisis, which provided insights into the cultural, societal and environmental drives of conflict, famine, terrorism, fear and suffering, and dislocation, which I was then able to apply to the characters in my novel. As I started formulating a general plot for this story, it was obvious that historical events would have to play a part – China's First Hundred had been sent to the US as an indirect result of the two Opium Wars. The Cultural Revolution was yet another war, and between these two had been the First and Second World Wars, and there was also the Korean and Vietnam wars, so that the primary focus of this book's idea changed from simply being a contrast of two characters to a novel about the ordinary person's life as a result of major political events. I was not trying to rewrite history or fill real or imagined gaps in historical knowledge – the whole story was a work of imagination – but even so, I knew there were facts I couldn't change. For example, I could not open the borders between China and Hong Kong at a time that suited me, ignore the White Australia Policy, or pretend Mao never existed. Neither could I simply invent the symptoms of cholera, nor the layout and structure of an Adelaide jail cell in the 1960s. If this novel was to be believable in the sense that it allowed the reader to suspend disbelief, the details of actual historical facts had to be correct, especially when considering that there would be readers who had been alive during the later sections of this story, and who may even have experienced some of the events my characters would experience. I began to narrow my research, and it soon became apparent that this fell into two broad categories: what I called 'psychological research', and 'factual research', though there were times when these boundaries became blurred, and I soon found myself delving into anthropology, sociology, history, religion, art, psychology and psychiatry, as well as many other disciplines. And whilst many of these books and papers provided a detailed - but somewhat cold –understanding of the topic I was researching, the ones I found most helpful were obscure titles – often long out of print – that had not been written for any publishing market, but had been edited and translated into book form some years after the fact – items such as diaries, letters and so on. These proved to be pure gems in regard to research as they didn't provide lifeless charts and data, but rather reflected the thoughts and feelings of their author. For example, A Chinaman's Opinion of Us and his Own People is by social reformer Hwuy-Ung, Mandarin of the Fourth Button, who escaped to Australia in 1899, where he wrote letters to his friend Tseng-Ching describing his reactions to what, to him, were the barbaric customs and manners of Westerners. But if books and papers provided an abundance of information, more so did film and images. I can imagine much more from a photograph or film sequence than I can from any amount of text, so made full use of the Internet and YouTube, where old newsreels and amateur-film footage abound. That there was often no dialogue, or that the dialogue was not in English, didn't matter. To be able to freeze, for instance, footage of a street in Shanghai in the 1930s, or a square full of Red Guards listening to Mao, and spend time examining every minute detail, was where its value laid. I also decided to enrol in a course in Mandarin. I didn't for an instance believe that I would be able to learn such a complex language as Mandarin in what amounted to just a couple of hours a week for a year, and also realised that, without constant practice, I was likely to forget it all within weeks of finishing the course, but still I felt studying a language totally different from the European ones I know would not only help conceptualise the possible difficulties my characters may encounter, but also provide further understanding of the culture I was writing about. I soon found my work area becoming lost under an avalanche of books, papers, maps, photographs and so on, and I realised I had a mountain of information to process, and more importantly, to remember. So I drew up an Excel chart with each of my characters' names across the top horizontal axis, plus three extra columns headed Australia, China/Hong Kong, and Other, which comprised dates and data relevant to that period. Along the vertical axis I entered the years covered by my novel, and in each character's cell, their age for that particular year. I then entered major movements and events of each character's life in the appropriate cell, as well as titbits of information on fashions, hairstyles, music and so on. As I gathered new pieces of information, they too were entered in the appropriate section. I was then able to tell at a glance the age of a particular character in regard to a particular event, whether they were old enough/too old to take part in that event, how – considering their age – they were likely to be affected by that event, what music they could be listening to and so on. The chart also became a general plot line to keep me on track. Since writing The Yellow Papers, I have discovered Aeon Timeline, which does the same thing more effectively! The Yellow Papers took over a year of initial research, before I felt I knew enough about the era and places to start writing. Further research continued as my characters and the story developed. The Yellow Papers is now in its second edition, and has been well reviewed. But the two comments that meant the most to me came when I was invited to promote my book in China for the Bookworm Literary Festival and the Shanghai Literary Festival in March 2014. One was from a Chinese gentleman who could not believe I hadn't been in Shanghai before, because "it's obvious you know Shanghai like the back of your hand! ", and the other came from an elderly lady who had lived in Hong Kong as a girl, who said The Yellow Papers took her right back – "I could even smell the place when I was reading the section about Ming Li! ", she said, excited to recognise a bit of her past. Poster during the Cultural Revolution, Song of the Red Guards, Red Guards, truearmy: 2007.